"Oak Point, Washington and Oak Point, Oregon"
Click image to enlarge Oak Point, Washington, from Mill Creek. 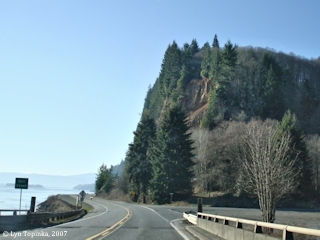 View from car driving west on Washington State Highway 4. The Columbia River is on the left. Image taken January 28, 2007. There were two "Oak Points", one across from the other, located along the Columbia River. 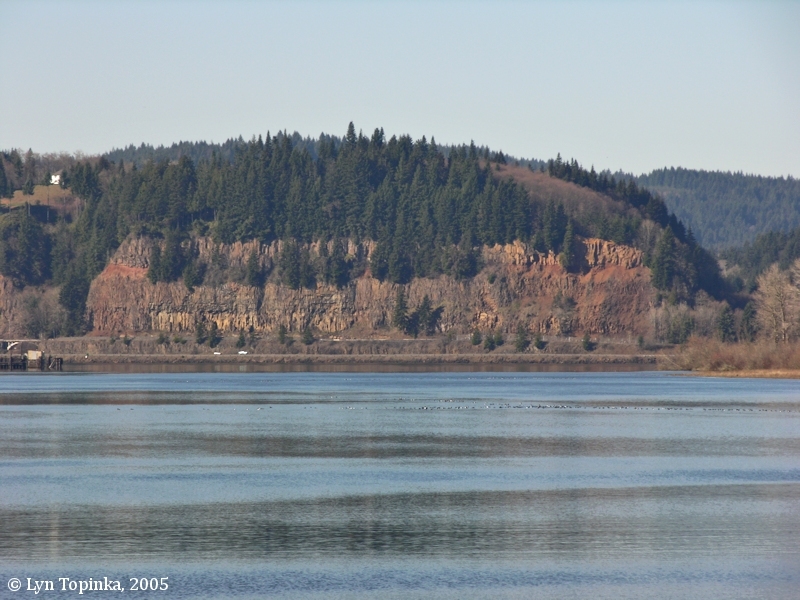 Today's "Oak Point" is located on the Washington side of the Columbia River at River Mile (RM) 54. This Oak Point is located fourteen miles west of Longview. On the east side winds Mill Creek, and just upstream is Abernethy Creek. Downstream is County Line Park and Eagle Cliff. On the Oregon shore across from today's Oak Point is the lower end of Bradbury Slough and the lower tip of Crims Island. Originally the name "Oak Point" belonged to a location on the Oregon side of the Columbia River, today the location of Port Westward. On October 28, 1792, Lieutenant Broughton of the George Vancouver Expedition named a place "Oak Point" on the Oregon side of the Columbia River near today's town of St. Helens, Oregon, near Caples Landing. On March 26, 1806, the Lewis and Clark expedition passed through this area and Captain Lewis entered a comment in his journal about the oak trees on the tip of "Fannys Bottom", today the location of Port Westward on the Clatskanie River/Beaver Slough delta. On June 1, 1810, Nathan Winship, William Smith, and others of the Winship expedition on the ship Albatross came upon this (???) grove of oak trees on the south bank of the Columbia River, and named the locality "Oak Point". This point was west of and across Bradbury Slough from the west end of Crims Island, the location of today's Port Westward. In 1841, Charles Wilkes of the U.S. Exploring Expedition charted this Oregon Oak Point on his maps. 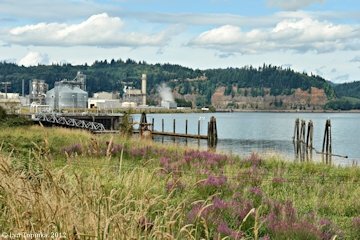 A few years after Wilkes, George Abernethy established a mill on the Washington side of the Columbia River and used the name "Oak Point". 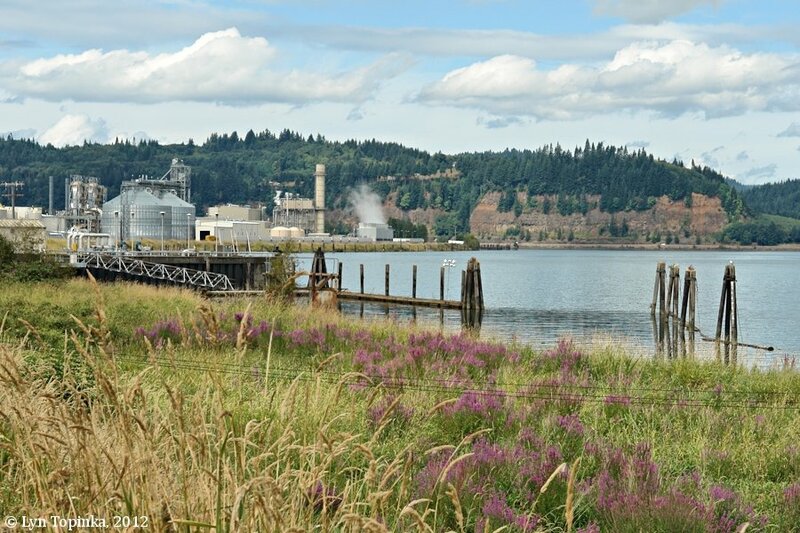 Oak Point has remained on the Washington side of the Columbia River ever since. Click image to enlarge Port Westward, Oregon, once known as "Oak Point", looking across to today's Oak Point, Washington. Image taken August 27, 2012. 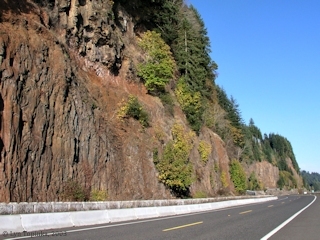 A massive basalt cliff on the Washington side of the Columbia River marks "Oak Point". 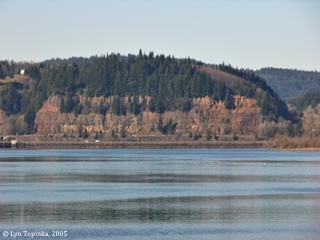 Click image to enlarge Oak Point, Washington, from Bradbury Slough, Oregon. Image taken February 21, 2005. 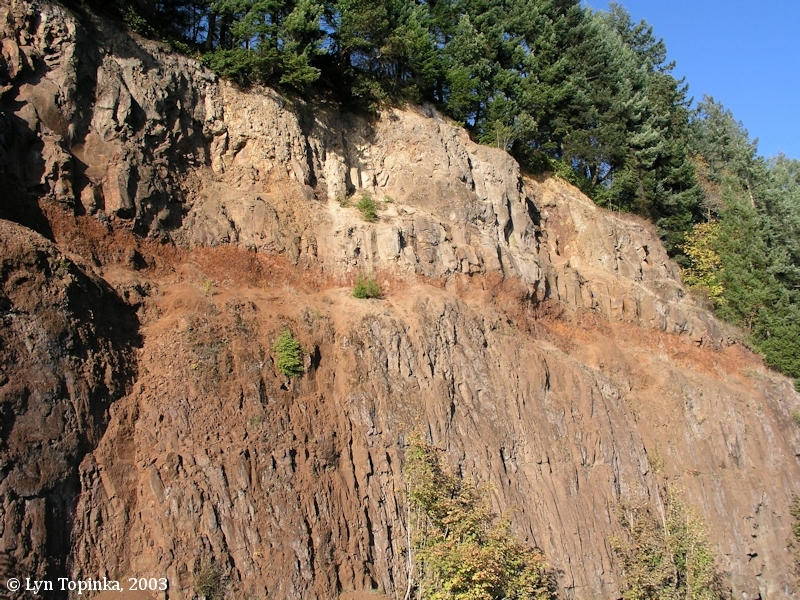 Click image to enlarge Basalt cliff below Oak Point, Washington. Image taken November 9, 2003. Click image to enlarge Weathered basalt cliff below Oak Point. Image taken November 9, 2003. Lewis and Clark are given credit for "discovering" the Oregon White Oak. On October 20, 1805, Lewis and Clark first came saw the acorns of the Oregon White Oak in an Indian Lodge near Roosevelt, Washington, and were informed they were collected from the Celilo Falls area. It wasn't until the return trip however that Captain Lewis collected a sample of the oak to include in the expedition's botanical collection. 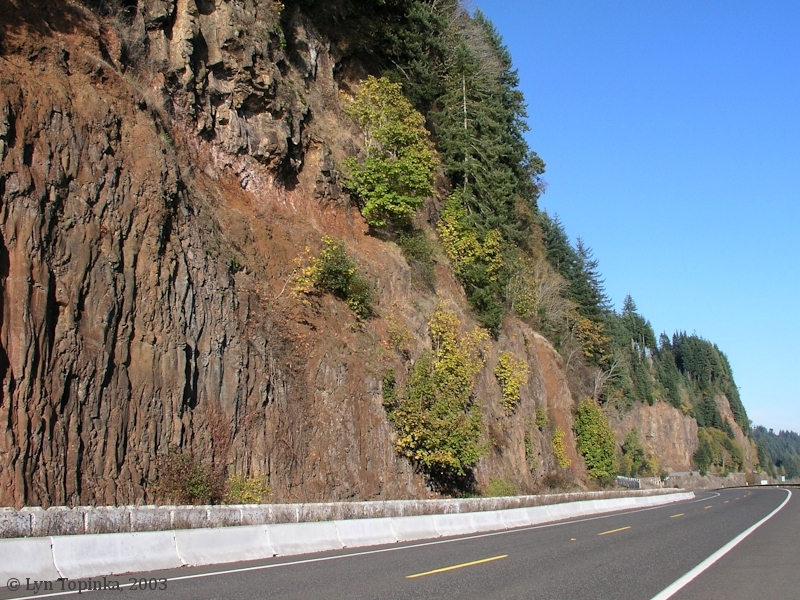 Records show he collected the sample on March 26, 1806, at which time the men were below the mouth of the Cowlitz River. Explorers and traveleres called the oak grove at "Fanny's Bottom" - today's Clatskanie River floodplain - "Oak Point" for many years until the name became associated with a spot on the north side of the Columbia River. after dinner we proceeded on and passed an Elegant and extensive bottom on the South side and an island near it's upper point which we call Fanny's Island [Crims Island, the "upper point" is today's Port Westward] and bottom [Clatskanie River/Beaver Slough delta] . the greater part of the bottom is a high dry prarie. near the river towards the upper point we saw a fine grove of whiteoak trees [Oak Point, Oregon]; we saw some deer and Elk at a distance in the prarie, but did not delay for the purpose of hunting them. we continued our rout after dinner untill late in the evening and encamped on the next island [Walker Island] above fanny's Island [Crims Island]; we found it difficult to obtain as much wood as answered our purposes.